I’ve been really into apocalyptic films lately. It’s more than a sit on the edge of your seat and bite your nails experience as I watch people panic when the world falls apart. There is something really profound and compelling about them. Watching our carefully constructed world descend into chaos can be an intense look at human nature. Propriety is snuffed out in the face of imminent ruin and people’s true selves emerge when survival mode kicks in. When the characters look in the face of death, it looks back at them and then people show what they’re really made of. In the film “How I Live Now”, the audience watches the main characters as they overcome the adversity they face, as the world is torn apart by war. 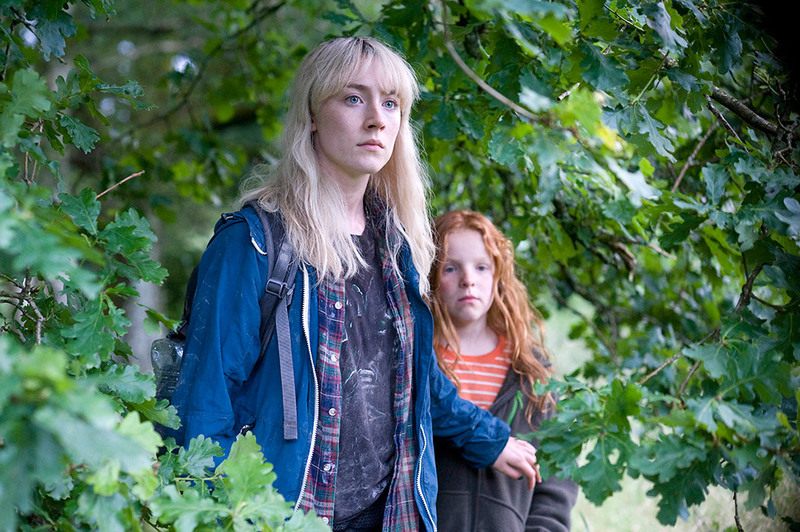 Starring Saorise Ronan (Hanna), the movie How I Live Now is based on a novel written by Meg Rosoff and it takes place in the near future where the world is on the verge of World War III. The movie starts out loud and in your face. In the opening scene, we meet Daisy. An angst filled teen who exudes an inexplicable anger and angrily struts throughout an airport with her headphone blaring her music. Daisy is exiled by her father to go visit her family in England and resents it. The film shows her growing closer to her family and taking to the beautiful, tranquil nature of the British countryside. Daisy and her eldest cousin Eddie fall in love and begin an intense (and incestuous) love affair. These scenes with her family interlaced with the approaching imminent presence of war are powerful, as it evokes an innocence that will soon be changed with the arrival of war. All is well, until a nuclear bomb is dropped on London. The war finally shows up on their doorstep and disrupts their tranquil existence. Soldiers force them to evacuate their home. As they drive into the city, the movie doesn’t shy away from showing the carnage of war. The streets are littered with the dead and destruction surrounds them. They even show a child being gunned down by enemy soldiers. The world has transformed into a dystopic, militia-run state. The shift of the atmosphere of the movie is sharp. The hopeful, healing atmosphere of the simplicity of the countryside to dark and ominous when the soldiers arrive is poignant. In that moment, you know it’s not just a movie about a young girl falling in love for the first time. It makes their loss of innocence more sharply felt. This movie is haunting and deals with complex themes of family, forgiveness, and self-acceptance. The acting was excellent and the cast carried the heavy content of the film well. The downfall of the movie is its uneven writing. The cast is fantastic and whenever the scenes falter, it’s the fault of the writing not the actors. The potholed writing really shows in the romantic interactions between the two lovelorn characters. I loathe every love scene between Daisy and her cousin Eddie. I inwardly cringed at the film’s failed attempts to portray this passionate, deep love affair between the kissing cousins. I haven’t read the book yet but perhaps, their relationship has more complexity and it handled better. I kind of wished they drew out the beginning, made it longer and created more of a substantial connection to the characters. I was indifferent to their love story which was the primary focus of the movie with WWIII being the backdrop. Also, it’s intimated that Daisy has an eating disorder. She also deals with overlapping voices in her head that berate her. The scriptwriting fails to really address these in an impactful way. The movie glazes over these internal conflicts that Daisy experienced and presented them in a confused and ineffective manner. There are sacrifices that film understandably has to make when adapting a novel but the writing falls flat when handling the respective complexities of the characters. Besides the flaws of the writing, the movie is still has redeemable qualities that kept me invested throughout the film. The story is ripe with emotive moments like the scenes Daisy and her youngest cousin as they struggle to stay alive and make it back home. I wouldn’t watch it again but I don’t feel that it was a useless movie experience. The movie may be heavily flawed but the moments that were good were full of emotional punch that kept me in the story.